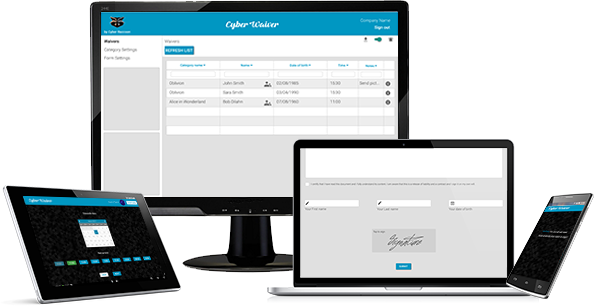 Cyber Waiver is a digital service system that allows you to convert, sign and store liability waivers other legal documents in an electronic format. The process is quick, paperless and secure. FREE service with unlimited number of signed waivers. Connected through web. Does not require internet connection. A yearly fee applies. Detailed description from both, company-side and customer-side. We included Demo configuration to the App so you can give it a try. Download the App to your Mobile device to get started. You like it? You keep it! Unlimited digital waivers. No matter how many signs you get a month. Optimized searching interface. Review a presorted information. Possibility for parents or legal guardians to sign for minors (age under 18). You can create your own fields. Ability to imbed to your website or provide a dedicated URL. Ability to export Data in CSV format to your email marketing service. Simple intuitive setting configurations interface. Local-based works offline without constant Internet connection.